Today: Meet the croissant's sweeter, caramelized cousin. Kouign amann (pronounced queen a-mahn) is the sweet and caramelized cousin of the croissant, hailing from the Brittany region of France. Brittany is known for its incredibly delicious, sea-salted butter, so it is no surprise that its most famous pastry is nearly 50% butter by weight. More: Store your best butter in this French butter keeper. Traditionally, kouign amann is baked as one large cake, but I think that individual treats are much more manageable. They also have more edges, which means more sweet, caramelized bits -- my very favorite part. This recipe starts with a simple yeasted dough that is laminated with layers of salted butter much like a croissant, but then it is also laminated with a generous sprinkling of sugar, which melts and caramelizes as the pastries bake. 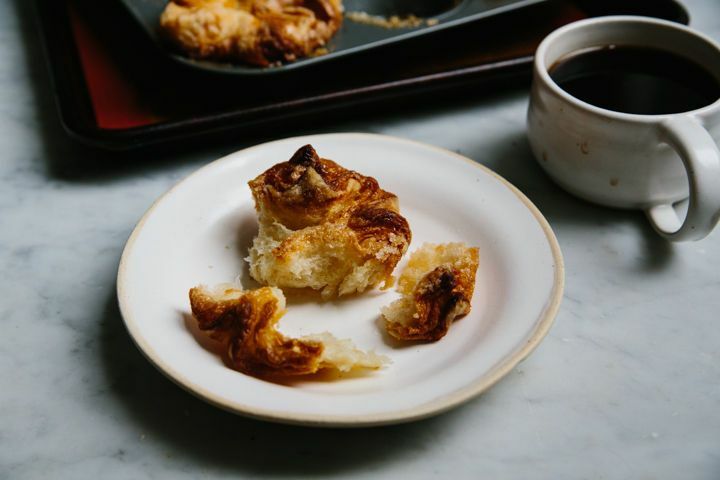 I admit that, like making croissants, making kouign amann at home is a bit of a process, but it's totally worth it, especially if you can't find them locally. This recipe is quite lengthy, so make sure to read it through at least once before starting. If you'd like to make these treats over the course of a couple of days, there are a couple of places where you can pause the process, and I've noted them in the instructions below. Combine the water and yeast in the bowl of a stand mixer and stir to dissolve the yeast. Let the it proof for about 5 minutes, or until bubbly. Add the flour and salt and stir to combine with a wooden spoon. Using the dough hook attachment, knead the dough for 4 to 5 minutes or until it is smooth, but still tacky. 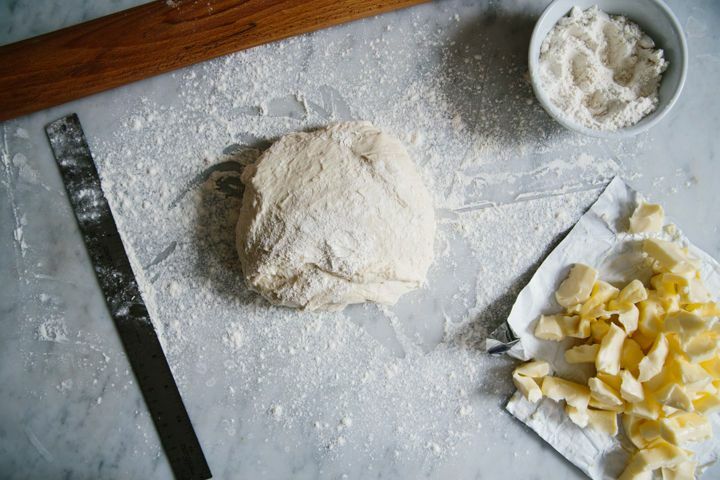 If the dough sticks to the bowl, add flour, one tablespoon at a time, until the dough is smooth. 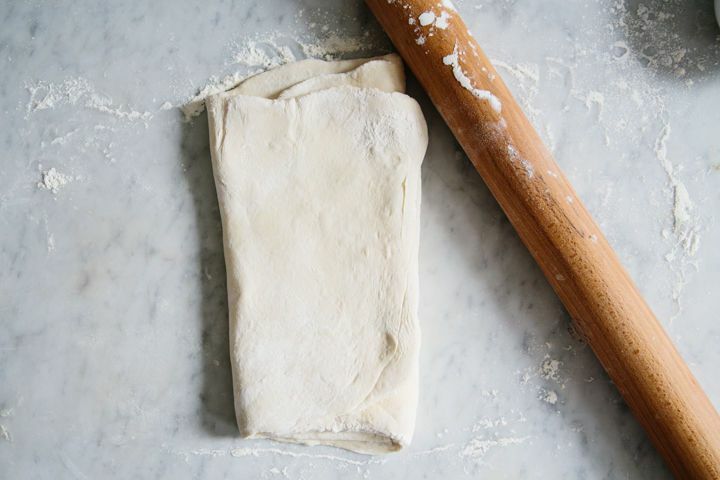 If the dough seems stiff and dry, add water one tablespoon at a time until the dough is smooth. Cover the bowl with a clean towel and let it rise for one hour, or until it doubles in size. Alternately, let the dough rise in the refrigerator overnight, covered with plastic wrap. After the dough has risen, put in in the refrigerator to chill for 30 minutes. 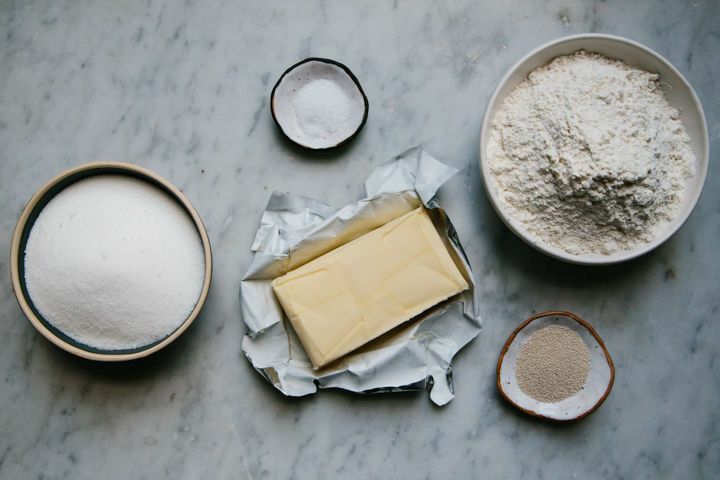 This will help keep the butter cool in the following steps. If the dough proofed overnight in the refrigerator, this step is not necessary. 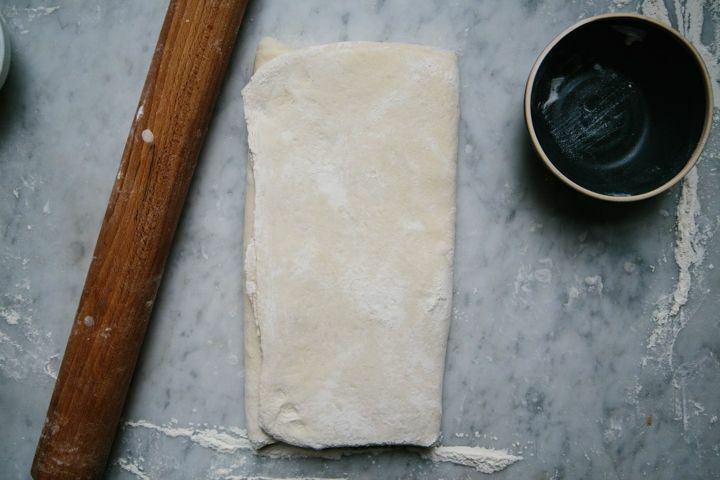 Roll the dough into a roughly 12 x 20-inch rectangle on a well-floured surface. Gently and carefully spread the cool-but-pliable butter on to the left two thirds of the dough. Leaving the right third bare. Fold the right, unbuttered side of the dough over the buttered dough, then fold the remaining 1/3 of buttered dough over to the right, like a letter. 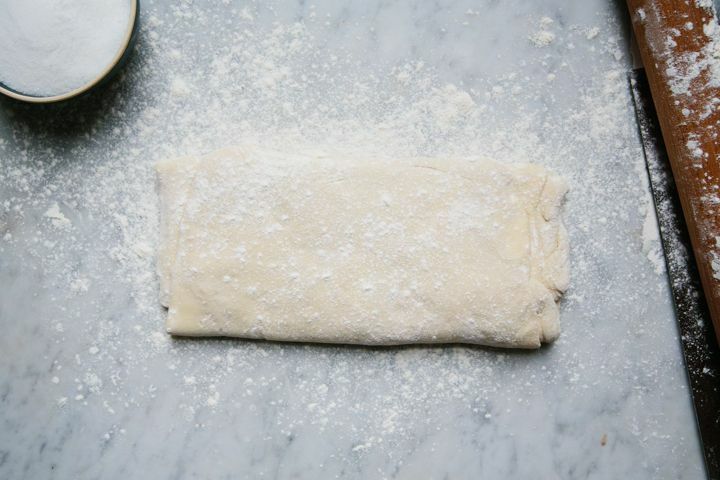 Gently press the seams of the dough to hold the butter in place. Flour the board again if necessary, rotate the dough 90 degrees, and roll it into a roughly 12 x 20-inch rectangle. Again, fold it into thirds like a letter. 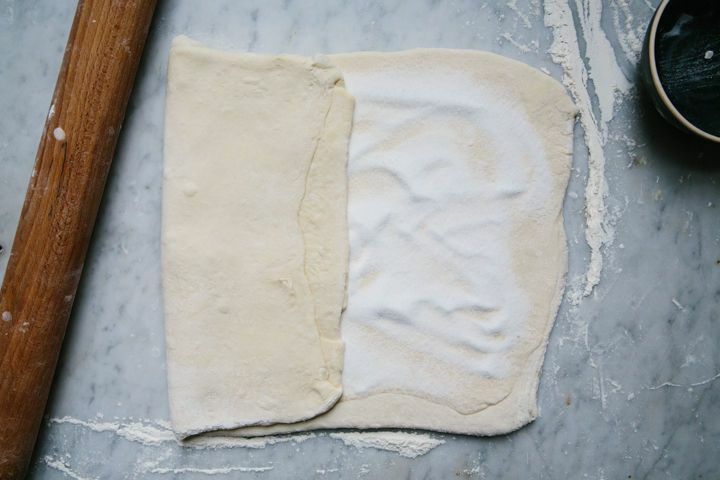 Transfer the dough to a lightly floured quarter sheet pan and place in the refrigerator for 45 minutes. Be careful to not let the dough get too cold; otherwise, the butter will harden and tear the dough when you try to roll it out again. 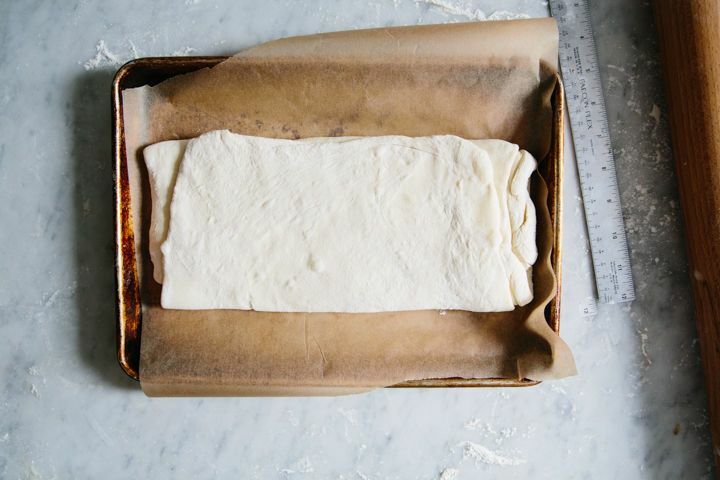 Remove the dough from the refrigerator and transfer it to a well-floured surface and again roll it into a 12 x 20-inch rectangle. Sprinkle the dough with 3/4 cup of sugar and press the sugar into the dough gently (this will seem like a lot of sugar -- don't worry!). Fold the dough into thirds, like a letter, and repeat the rolling, sprinkling, and folding process with the remaining 3/4 cup sugar. 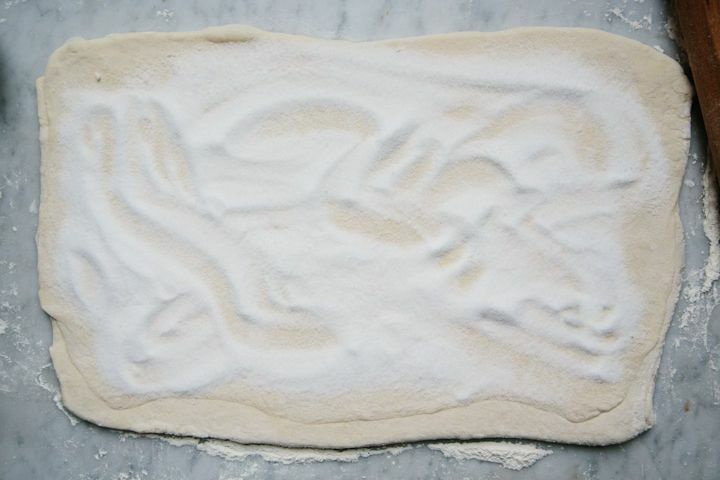 Transfer the dough back to the floured quarter sheet pan and chill for 30 minutes. While the dough is chilling, prepare the muffin tins by very generously buttering them and arranging them on parchment-lined baking sheets. Remove the dough from the refrigerator and transfer it to a surface that has been generously sprinkled with sugar. 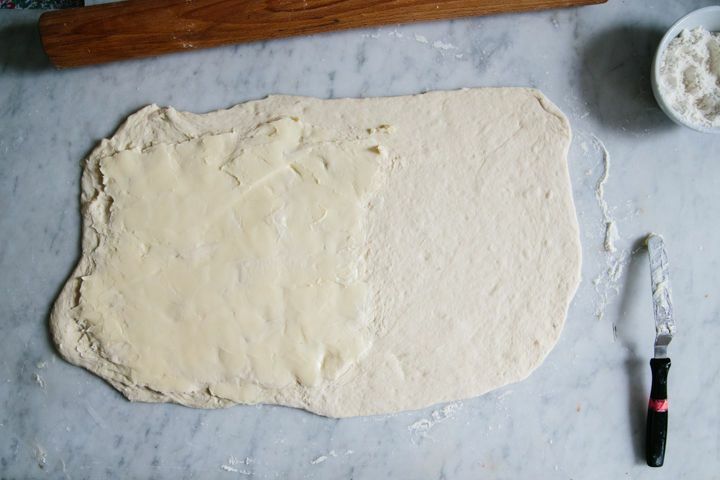 Roll the dough into a rectangle roughly 8 x 24 inches. 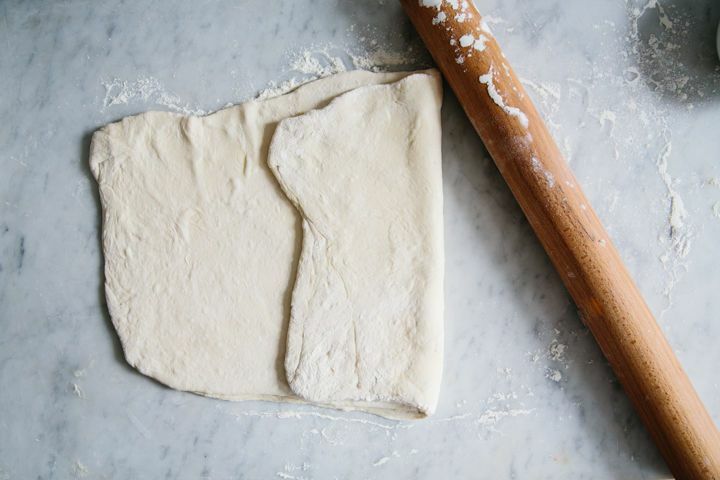 Use a pastry wheel or pizza cutter to cut the dough into 12 even squares. 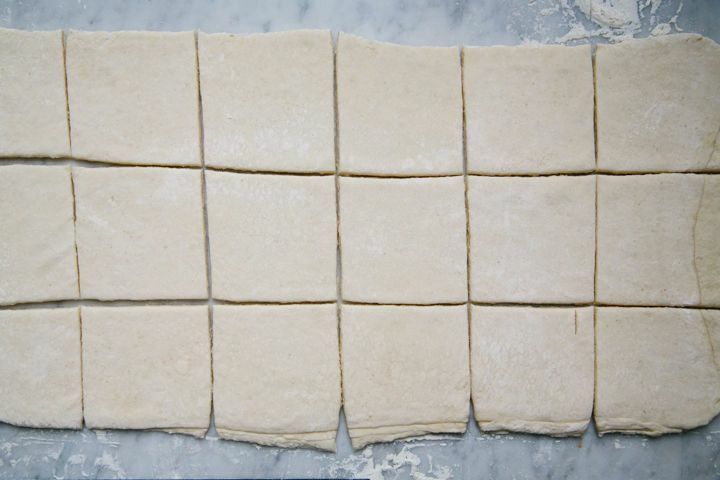 Fold the corners of each square towards the center and tuck each square into the muffin tin or pastry ring. Let them rise until slightly puffy, 30 to 40 minutes. Alternately, the kouign amann can be refrigerated overnight (before rising) and baked the next day. If you'd like to take advantage of that option, make sure to bring the pastries back to room temperature and rise before baking. 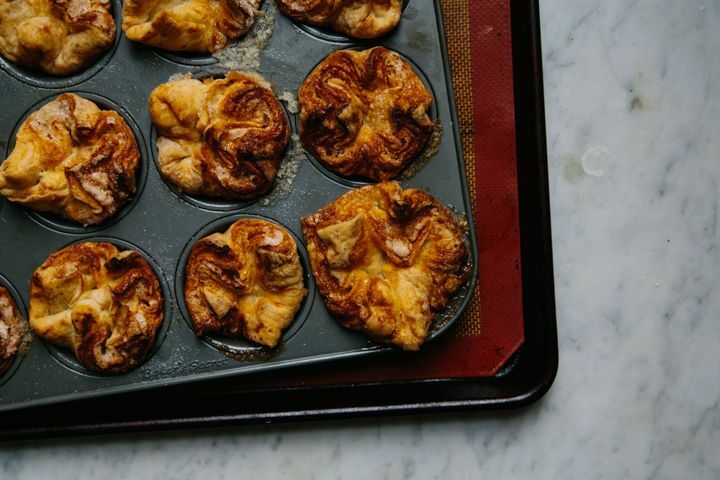 While the kouign amann are rising, preheat the oven to 400º F. Place the baking sheets into the oven and lower the temperature to 350º F. Bake for 40 to 45 minutes, or until the pastries are a deep golden brown -- they should be just shy of burnt. 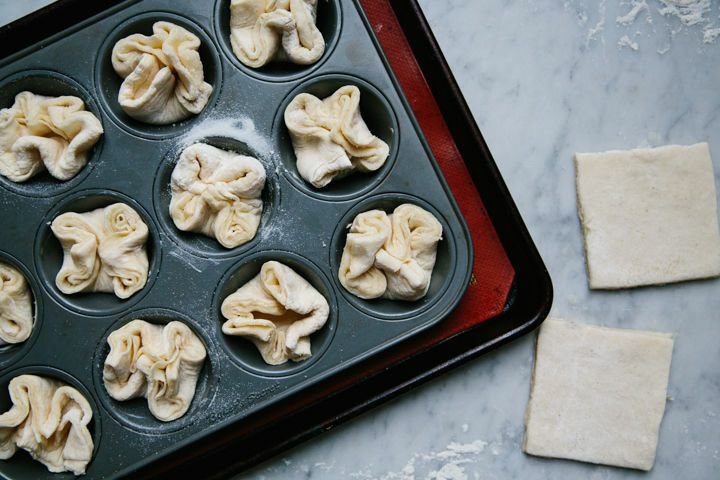 Let the kouign amann cool briefly, then remove them from the muffin tins or pastry rings. Do not let them cool in the pans, or they will stick and you will have a real mess on your hands. These treats are best enjoyed warm, the day that they are baked. Question please. Why is parchment placed between the muffin tin and the baking sheet? I can't believe this recipe turned up in my email today. Late last night I watched a TV show about a kiwi baker who re-created these tasty delights, and I went to sleep dreaming of what I thought was Queen Amonn. I couldn't find anything when I Googled the recipe (because of my incorrect spelling). Talk about synchronicity! I can't wait to make them. Thanks for sharing the recipe. These look great! I am not a baker but, I may try to get a friend to make these. I'm a sucker for croissants and it would be nice to try these fresh out of the oven. Yumm! Great recipe. Thanks for sharing! Hi Linn, when I shot these photos I made a larger batch and cut the dough into 16 pieces. If you decide to make these you should cut the dough into 12 pieces as the recipe calls for. Sorry for the confusion. thank you so much for sharing! these are my favorite. Though I say, I don't bake; your clear instructions and this dessert has provided a lot of incentive. thank you! 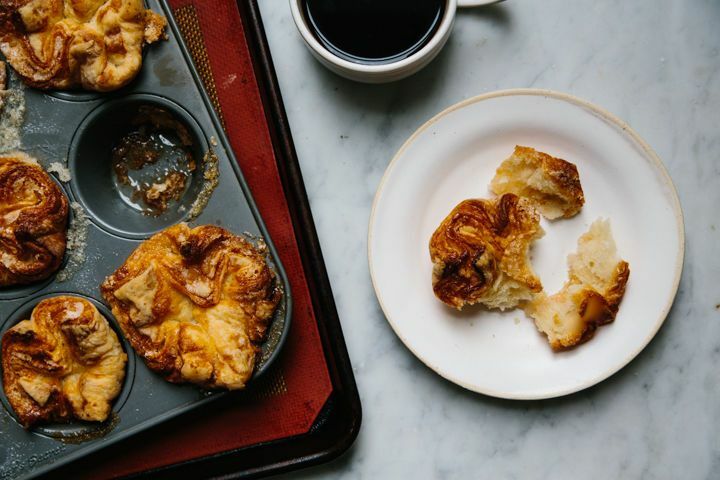 I regularly check out the new recipes from Food52 and I couldn't believe it when I saw "Kouign Amann" on the first page ! I am 100% bretonne (girl who is originally from Brittany) and there is nothing more delicious than all the good pastry made in my region trust me! I've tried making Kouign Amann before. I made a giant one in a pie (cake?) pan. Let me tell you, it's quite a process. It's not hard per se but anything that requires proofing, resting, lots of soft sticky butter, and multiple rolls and folds is very time consuming and finnicky. For the same reason, I don't enjoy making croissants at home. Here's a tip for those who want a shortcut - go buy it at Trader Joe's in the frozen section. You get 4 of them in a package and they are great. Thanks for the tip. It sounds really good, but not suited to my skill set. On the other hand, going to Trader Joe's I can do! This cake is an addictive keeper!. I'd made it from Amanda Hesser's recipe in the NY times cookbook a couple of weeks ago. The muffin tin idea is CAPITAL! Thanks so much for sharing. Oooh, I love Kouign Amann! I made these a few weeks ago at the restaurant where I work. They were a huge hit! It was a little disconcerting how the layers separated when I folded in the sugar, but they came out fabulously. Thanks for sharing!